After Charles and Auntie Winnie got the baby, Winnie put some new clothes on him, and wrapped him in more blankets to keep him warm. They arrived to Malayaka House at around 10 am, and we decided to quickly take him to the clinic. The baby was very cold and the first thing they did at the clinic was to put him in the incubator to warm him up. His temperature was around 31ºC and was raised up to 36.5ºC (the temperature that babies are supposed to have). Then they sent us to a room, and started him on antibiotics because he had a skin rash that the doctors thought may have come from the mother. We stayed at the hospital for three days, to make sure the baby was okay. That was last week, and the little guy is doing quite well. After several days in the hospital, he is finally home, but he cannot be around other children yet because he is still too weak for immunizations. He stays in a room next to mine, and the children are so excited to meet their new brother. Even though he cannot see them yet, our new baby is surrounded by the love and affection of his many new brothers and sisters. The aunties and I are taking turns sleeping with him each night. We have named this baby Sam Owori, in honor of a fallen hero, a good friend and Rotarian who recently passed away, unexpectedly. This tiny soul seems to have been given an inconceivable strength. In reality, a cold, newborn left in a plastic bag for hours should never have survived. 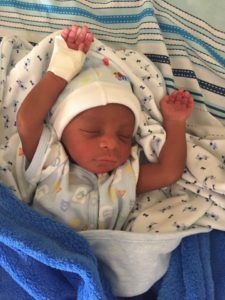 Little Sam Owori has been blessed with a great strength, against all odds, just like his namesake. He is a fighter, and we have no doubt he will achieve much in his lifetime, just like his namesake.